This healthy meal prep recipe has juicy ground turkey meatballs served with shishito peppers and paired with a quinoa and black beans for the ultimate weight loss recipe. I love using ground turkey for my meal preps. It’s nice to switch it up a bit and turkey is leaner than beef but still has big flavor. This meal prep recipe for healthy ground turkey meatballs is easy to make, moist and juicy, and makes 5 servings for meal prep. 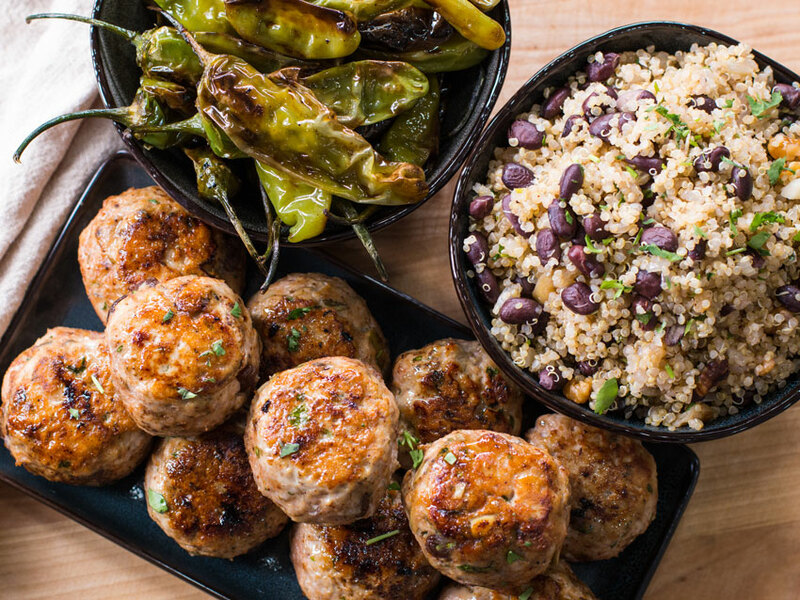 It’s not every day you see baked turkey meatballs that are seasoned with raisins and pepitas, but they add big flavors and textures to this recipe. The meal prep is served with charred shishito peppers (which I get from at Trader Joe’s) and my take on Mexican rice and beans using quinoa. The entire meal prep is easy to make and a great way to use ground turkey in a recipe. I would highly recommend using ground turkey thighs for this recipe as they have more flavor than breasts and won’t dry out as easily. Once again, I buy my turkey at TJ’s. Jeez..they need to start paying me for giving them so much love! I think what gives the turkey meatballs such good flavor is a quick sear in a hot pan before getting baked in the oven. Yes, you can skip this step and place the turkey meatballs on a sheet tray ad bake them, but you are missing out on the opportunity to add massive flavor by searing the meatballs and forming a golden brown crust. Just like when you sear a steak, that layer of crusty goodness adds so much flavor. Don’t you want that in your baked turkey meatballs, people!? 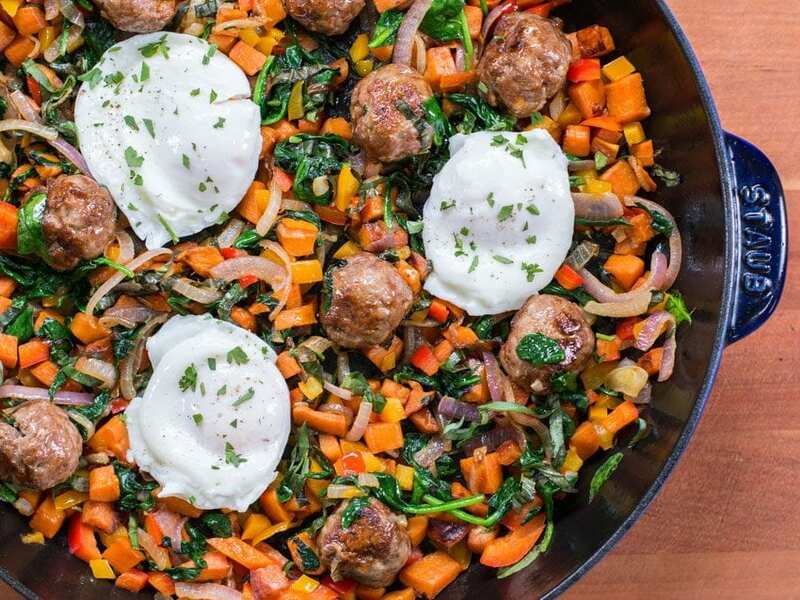 The entire meatball recipe makes enough for 5 servings of meal prep for the week. How Do I Cook Shishito Peppers? My wife loves to order shishito peppers whenever she sees them on a restaurant menu. Don’t get me wrong. I love those sweet and spicy little peppers too, but I don’t like paying $8 for it. Once I realized that TJ’s sold shishito peppers in their store for $2 per pack, I won’t let Dessi order them at restaurants anymore! There I go again, you owe me one, TJ’s. All you have to do to make really tasty shishito peppers at home is have a smoking hot pan with a touch of oil in it. Toss the peppers in and let them blister for 4-6 minutes until the exterior looks charred and the interior is soft. Get them out of the pan and season with a pinch of salt and a squeeze of lemon or lime juice, and you will never order them out at restaurants ever again! 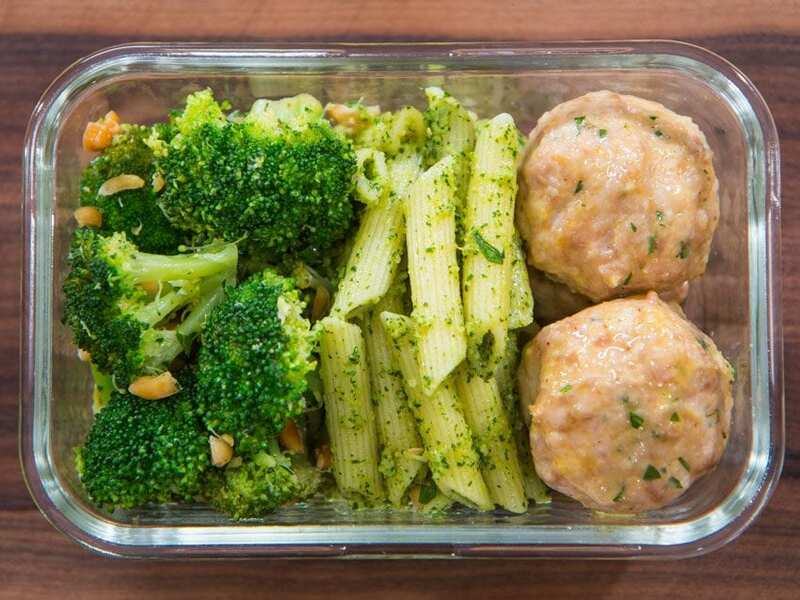 This meal prep recipe is perfect for weight loss because we are using lean ground turkey to make the meatballs. Plus we swapped out starchy rice and are using quinoa to mix with the black beans. Each meal prep serving has 563 calories and 23.2 grams of fat, and the meals are very satisfying. The recipe makes 5 servings of meal prep for the week that can last in the fridge for 5 days or can be frozen for 2-3 months. The best way to reheat the meal prep is in a 350 degree F oven for 7-10 minutes. If using a microwave, cover the container with a wet paper towel and make sure not to over-heat as the turkey meatballs will get dry. This turkey meal prep is my healthy take on the Mexican dish chile en nogada. 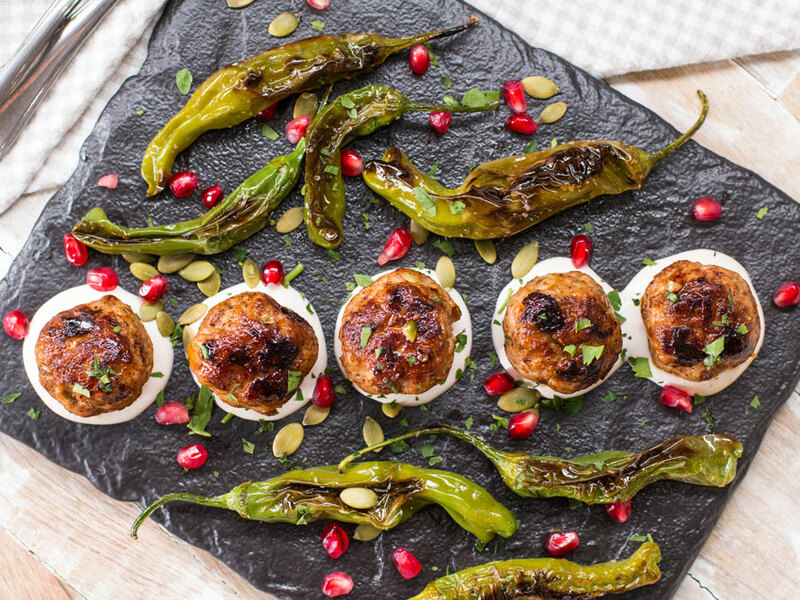 The turkey meatballs are low fat and studded with raisins and pepitas. Instead of starchy rice, I used the superfood quinoa and mixed it with seasoned black beans and lime juice. The charred shishito peppers are slightly sweet and smoky, a well balanced healthy meal prep. Cook’s notes: 1 cup of raw quinoa makes 3 cups of cooked quinoa. This recipe works best with leftover quinoa, so make it the previous day or at least 3 hours before starting the recipe. You can cool it down and let it dry by spreading the quinoa on a sheet tray and keeping at room temperature or the fridge. You can find shishito peppers at trader joe’s or sometimes at the bulk section of whole foods. If you can’t find, use roasted red peppers from the jar. For the meatballs, add the ground turkey to a large bowl along with the ancho chile, cumin, cayenne, thyme, raisins, pepitas, cilantro, 1 teaspoon salt, and a coupe cracks of pepper. Mix very well using your hands, dip hands into water, and form into meatballs that are slightly larger than a golf ball, should make 15 balls. The water prevents the meat from sticking to your hands. Store formed meatballs in the fridge for at least 20 minutes so they can firm up. Meanwhile, pre-heat a large non-stick pan over medium-high heat for 2 minutes along with 2 teaspoons of oil. Add the onion along with ¼ teaspoon of salt and a few cracks of peppers. Cook for 6 minutes then add the garlic. Make sure to thoroughly drain and rinse the black beans then add them to the pan after the garlic has been cooking for 3 minutes. Add the ancho chile powder and cumin, mix well. Cook for 2 minutes then add all the quinoa, ¼ teaspoon salt, a few cracks of pepper, and mix well. Cook for 3 minutes, stirring often then turn the heat off and add the walnuts, cilantro, and juice of half a lime. Mix well and check for seasoning, you may need more lime juice and/or salt. Set aside. Pre-heat oven to 350 F and pre-heat a large pan(preferably cast iron) over medium-high heat for 2 minutes. Add 2 teaspoons of oil to the pan and wait 30 seconds before adding half of the meatballs to the pan, making sure not to overcrowd the pan. Cook on one side for 2-3 minutes or until golden brown, flip and repeat. Remove meatballs from pan and place on a sheet tray. Repeat with remaining meatballs. Place meatballs in the oven for 15 minutes, if you are not sure the balls are cooked through, cut one in half. Ground turkey can overcook and become dry very quickly so make sure to check the meatballs after 15 minutes. While the meatballs are cooking, pre-heat the same pan you used for the meatballs just below high heat. Add 1 teaspoon of oil to the pan along with all the peppers. Cook for 10-13 minutes or until nicely charred on all sides, stirring often. Turn the heat off and squeeze the juice of half a lime over the peppers and mix well, remove peppers from pan. 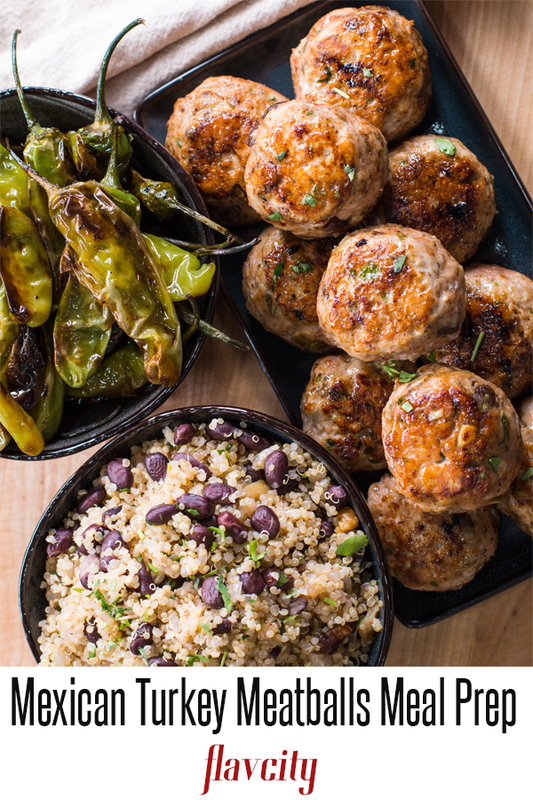 Serve the meatballs with some of the black beans and quinoa and some peppers. Garnish with cilantro and lime zest, enjoy! Everything will last in the fridge for 5 days, the meatballs and quinoa can be frozen for 2-3 months, but the peppers can’t be frozen. 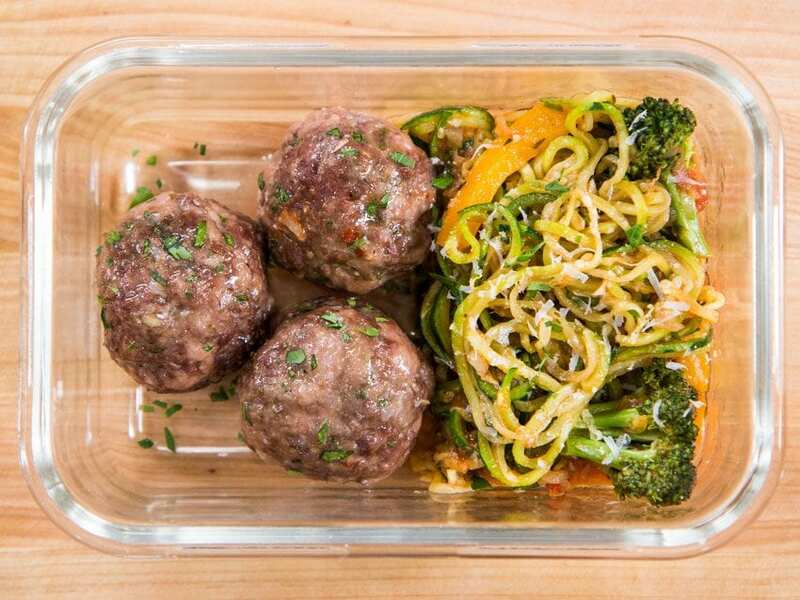 The best way to reheat everything is in a 400 F oven for 10 minutes, if using the microwave, cover the container with a wet paper towel and make sure not to overheat, otherwise the meatballs will get dry. Yes, I want it all, healthy, weight loss, quick, and easy meal preps. I have all of those for you Rea!